On 17 June, 1940, the troop ship Lancastria moored in calm waters off the west coast of France - her mission to help evacuate thousands of British soldiers fleeing the Nazis. But the afternoon was to end in disaster as, at about 4pm, the ship was struck by a succession of German bombs, causing at least 3,500 deaths. Sixty-five years later, a tragedy shrouded in secrecy for decades is being marked in France by a handful of British survivors. It was a sunny day in St Nazaire and assembled on the quayside were 30,000 battle-weary troops awaiting rescue, along with a handful of British civilian men, women and children. 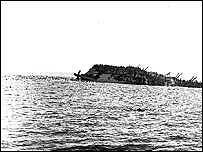 The Lancastria, one of 30 ships sent to evacuate them, took at least 6,000 people on board - some estimates put it closer to 9,000. For the exhausted soldiers, a place on the former Cunard liner meant they were safe at last - "Solid as the Strand Palace Hotel", as one put it. But, as the ship waited to leave the French coast it was spied by a German bomber and hit by four devastating bombs, which were to sink the 16,000-ton vessel within 20 minutes. Writer Jonathan Fenby, who has researched the tragedy for his book, The Sinking of the Lancastria, told the BBC News Website: "The bombs went into the ship's holds and exploded there, where a lot of the men had been sent to shelter. "One of the worst things was it was an oil burning ship so the seas were full of oil and some of it caught fire, as the Germans were strafing it with bullets. "A lot of them choked on the oil." 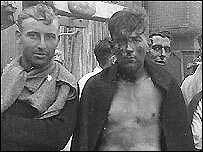 Many more drowned or were picked off by the German gunners. One of the civilian survivors later remembered: "If there was a hell, this was it." Small boats rushed to try to pick up survivors, but in the end only 2,500 were saved, making it the single worst maritime disaster in British history. The loss of life was so severe that then Prime Minister Winston Churchill forbade publication of the news, fearing its effect on morale back in Britain. 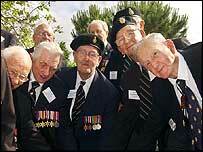 Mr Fenby says survivors were threatened with court martial if they spoke about what had happened back in Britain. 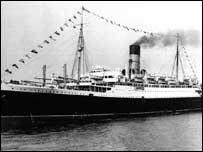 So while more people were killed than in the sinking of the Lusitania and the Titanic combined, the Lancastria tragedy was for many years excluded from history. But this week, about 100 survivors and relatives travelled to France to mark the tragedy's 65th anniversary, touring the vast war cemeteries looking for their fallen loved ones. The trip culminated in a trip to the wreck, accompanied by a flotilla of French vessels, and wreath-laying ceremony at the site of the wreck. It was an emotional occasion for all involved. Harry Harding, 85, of Salisbury, Wiltshire, was just 19 when he boarded the Lancastria. He told the BBC News Website: "I was on the upper deck and I saw the bombs being released from the aircraft, I saw devastation, so I swam for my life. He added: "I didn't see the Lancastria go down. But I saw the hull. I saw those clinging to it as the hope ebbed away and I could hear them singing. "They were singing There'll Always Be an England and Roll Out the Barrel. For a long time afterwards I didn't want to hear those songs." "Then I looked and it had gone down so quickly there was nothing, just a void." Many of the survivors are angry that no representative of the British government or military took part in the ceremony. There are calls for greater official recognition of the tragedy, including a recent motion in the Scottish Parliament for a memorial to the dead. Others want the site of the wreck to be officially declared a war grave. Mr Fenby, too, wants more recognition of the tragedy. "Any incident in which 3,500 or 4,000 people lost their lives should not be forgotten." The Sinking of the Lancastria, by Jonathan Fenby, is published by Simon & Schuster.